Enter Alexa. Chances are you’ve seen or at least heard commercials (while you were flipping through Facebook) for this “intelligent personal assistant” created by Amazon as another reason to never publish another encyclopedia. Does anyone even publish encyclopedias anymore? I have a problem with Alexa, or Siri, or any of the smart electronic devices that can recite lyrics to a song with a simple teaser or time your baked goods or order flowers. None of them teach you how to be polite. When is the last time you used “please” when you asked Siri to show you the most direct route to a Thai restaurant? Have you ever thanked Alexa for reminding you about your dentist appointment? Of course not. They don’t require you to use your manners. While this was not exactly the phrasing and emphasis I was going for, I had to acknowledge her clever way of covering all the bases. So, how are we teaching our kids to ask for things now? We aren’t, at least not with these electronic gadgets that have the answer or solution for almost everything. On a side note, I just had a flashback of my twenties, when I was sure my parents were old because they used phrases like “gadgets” – and here I am. I can almost feel my hair turning white in Second Born’s eyes as she sits across the living room from me. Back to my point of politeness. Spouse was given an Alexa as a token of appreciation from his work place. 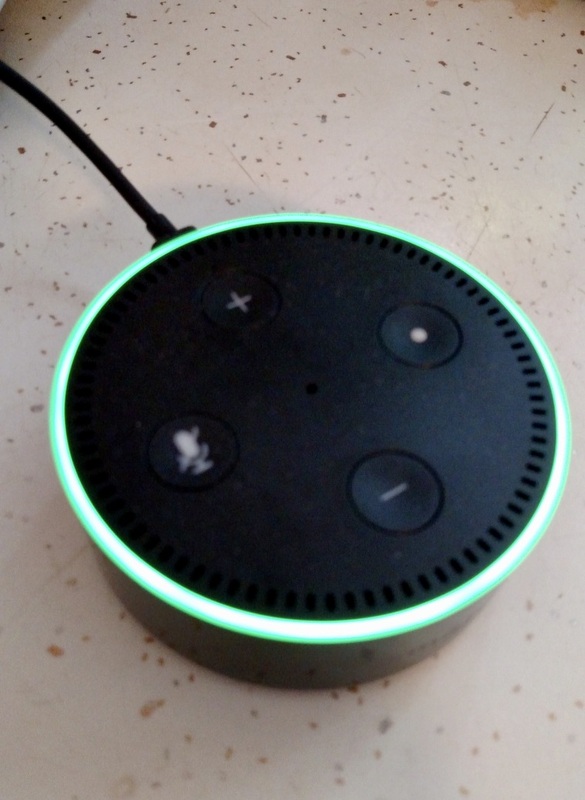 Alexa is sitting on our kitchen counter all charged up and ready to answer our questions. In fact, Alexa keeps reminding us how ready she is, if we would just start using the dang smart phone application and ask her some stuff already. I have added a condition to our use of Alexa. We must – and I mean MUST – always say please upon our request, and thank you when Alexa responds. I have also forbidden Spouse to call Alexa stupid. That’s one of his favorite words when his smart phone or his laptop does something to irritate him. Call me quirky (and I’m all right with that) but I don’t want anything with a name to be degraded. What if it rebelled and stopped working? Mind you, user error is a significant factor, but until my mate admits that sometimes he’s messed up, he is putting us all in jeopardy by being too critical of the electronics we are surrounded with. I, for one, don’t care to end up driving down a dead-end dirt road because my GPS decided we didn’t deserve to find our way home. If you think I’m crazy, do a YouTube search of Dave and Hal from A Space Odyssey. Am I being too persistent about politeness? Personally, I don’t feel you can be too polite or courteous. So, if you do take advantage of this new technology, use your manners, even if you are talking to an electronic know-it-all. That way you’re less likely to find yourself at a biker bar when you really just wanted Italian. On a final note, I should apologize for doubting Garth Brooks in the commercial where he asks for a weather update. Alexa really does know that "deep in her heart" the thunder rolls.